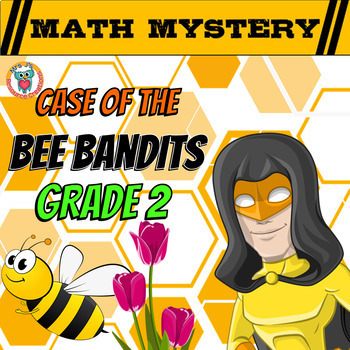 Spring Activity: Math Mystery - Case of The Bee Bandits - 2nd Grade Edition. Engage and motivate your students during math time with this fun spring math review! Easy prep - just print and solve! 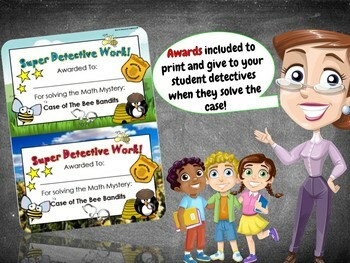 Ideal for spiral review, your students will be using their math skills to unlock clues that will help them solve the mystery! MP4 file included in the download. - Easy Prep! Print the student pages, staple or place in a folder, and your students are set to solve the math mystery. - Have the video hook ready for viewing at the start of the lesson on an IWB, iPad or computer monitor screen (optional). - Editable suspects list included: This enables you to change the suspect names to alter the final mystery outcome. Two alternative pre-made lists also included for a quick swap out. Students must use critical thinking skills to figure out what the clue is telling them to eliminate from the list of possibilities. I recommend pacing this activity by giving students one clue at a time. 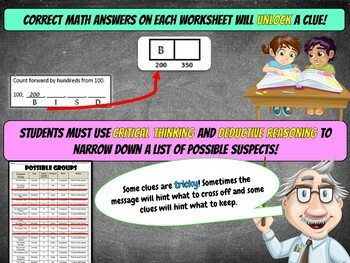 Once the whole class has completed a clue, then move on to the next clue either within the same lesson or the next math session. New math content presented? Make a lesson out of it by modeling the math before diving into the clue. I like to say, "we must learn something new before attempting the next clue." How long will this activity take? Time to complete will vary anywhere between 30mins - 2 hours or more! It mainly depends on how familiar your students are with the math mystery format, as well as how difficult they find math skills covered in the particular mystery. Please check the math skills outlined in the clues above to help determine suitability for your class. This Spring Math Mystery activity is available for GRADES 1-6! FIVE Easy Ways to use Math Mysteries in your Classroom. 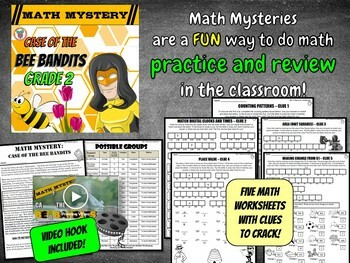 Browse the range of 2nd Grade Math Mysteries HERE.